Quick, right now. How many web browsers and tabs do you have open? I’ve got 15. Oh, wait. Until I look at my phone. That’s another 37. Yikes! Why do you have that many windows open? Me, I have so many open tabs because there’s either something I need to do, something I am in the middle of, or something I want to remember. Is this a problem? Maybe not for you. For me, open browser tabs and windows quickly turn into a digital junk pile, which doesn’t do anyone any good. 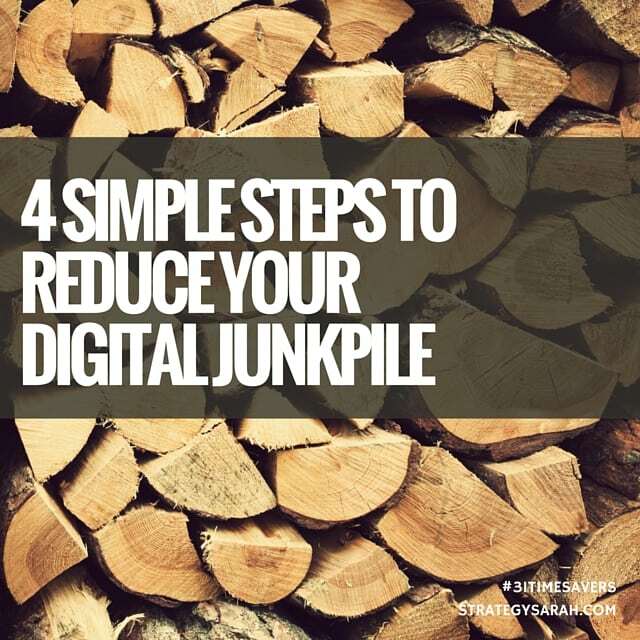 Don’t build up a digital junk pile in the first place. Set aside regular time either daily or weekly to review and address. I’m currently aiming for weekly. Close anything that is no longer relevant. Take action on every action item. Then close the window or tab. Save reference information to the appropriate spot. I use a combination of Evernote, Pinterest, and Dropbox, depending on the information. Tip for Google Chrome users: Did you know that you can see your phone browser history on your desktop computer? This is an easy way to view and address information quickly, then close the browser tabs on your phone.